Selling? Have YOUR PROPERTY FEATURED HERE on Delaware's beach real estate website. CALL TODAY! 877-520-SELL to see how we can help! MLS Featured Properties: WE WORK FOR YOU AS YOUR BUYER AGENT! 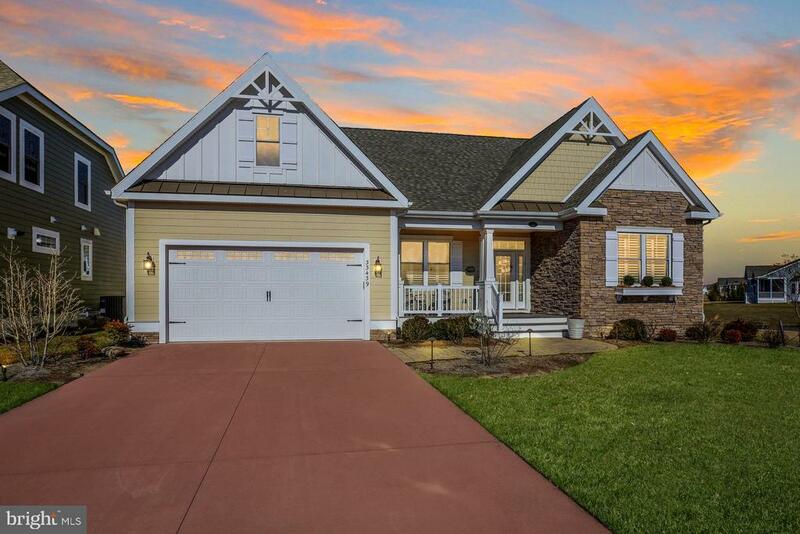 The difference is in the details in this gorgeous completed, custom built coastal home offered by Lane Builders, LLC. Bringing 35 years of passion & experience, fusing your vision w/ building perfection that is timeless. Located in the exclusive Sanctuary section of the Peninsula, the Newport Bay offers exceptional features: 6 spacious bedrooms & 6 luxury tiled baths, 4700 SF of living space w/ an additional 2100 Sf of outdoor entertaining spaces including; screen porches & a large concrete and brick patio , rooftop deck w/fireplace for your water view enjoyment & star gazing. Exotic engineered Brazilian Ash HW floors through out main living areas & bedrooms, 6 burner Thermador gas range w/ double oven, over sized counter depth refrigerator with dual temp wine chiller, SS Thermador appliances, center island w/ generous bar, high end cabinetry & quartz finish this gorgeous gourmet kitchen perfect for hosting. Dramatic woodwork & trim package, 2 laundry rooms, elevator & walk in storage. Open living spaces ideal for entertaining many guests. Great room with detailed cathedral ceilings and double sided fireplace accessible to the screen porch! 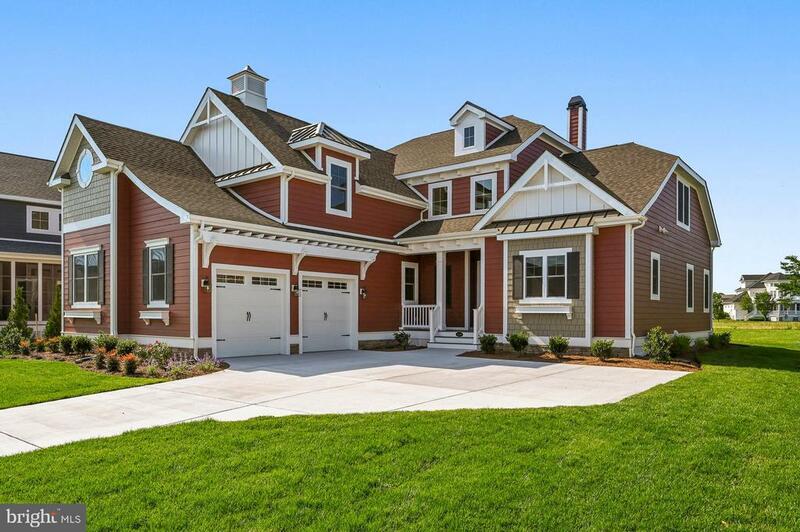 The entire architectural design of this home, inspired by the Ocean City Life Saving Station, is sure to please the most discriminating buyer!Come explore all that The Peninsula has to offer! Jack Nicklaus signature golf course in an amenity rich community with bay views and private beach awaits ! $10,000 incentive towards membership dues offered on any ratified contract signed prior to June 1st! Move in ready! Iestor Alert: Soon to be completed, Custom Built Garrison Home. With water views from all 4 levels, you simply have to see this house to appreciate all it offers. Large open floor plan, upgarded floors, kitchen, counters, appliancesand more...it even has a roof top deck! Every room in the house is big, so bring the whole family. Call now (302-396-1400) or visit our office located inside the Garrison Home Model located in the Sanctuary section of The Peninsula. New Price! Triple Mint condition located on a premium lot with sweeping views of the 11th fairway and lake! Why wait to build and pay a lot premium when you can pull into the stone paver driveway and have it all in this Klabe built home. New exterior paint and maintenance, $17K completed in May 2018. This 3,824 sq. ft. home boasts a smart use of space offering room for all your family, extended family and house guests in this 5/6 Bedrooms and 5.5 Baths. 5 Bedrooms have private baths. The second-floor family room can be used as the 6th bedroom. Enter the home and enjoy a soaring two story living room ceiling with a floor to ceiling stacked stone gas fireplace and two built in bookcases, cabinets and display shelves. The lower ten-foot ceilings in the dining room and kitchen offer intimacy and room definition. The gourmet kitchen features: white maple cabinets with dove tail full extension soft close drawers. The center island features storage cabinets with granite counter tops throughout the kitchen and breakfast bar. Stainless steel appliances including a 6-burner gas cook top, exterior vented hood, double wall coection ovens, warming drawer, wine cooler, built in microwave and fridge with ice-maker. Every room is oversized including the dining area. Gleaming hardwood floors span the entire first floor including the living room, dining room, kitchen, master bedroom, study, powder room and stairs to the upper level. The spacious first floor, double door entry, master bedroom with 8 windows, including a bay window to view to the golf course and lake. The luxury master bath features: cherry cabinets, granite vanity, double bowl sinks, deep soaking tub and separate walk in shower. The first floor also features a private study or home office with double glass French doors. Laundry with washer, dryer and work sink are off the kitchen through the mud room to the two-car garage. Let~s talk about the first-floor exterior spaces before heading to the second floor. Relax on the front porch and retreat to the expansive screened porch out back with room for dining, grilling and lounging while enjoying the premium views of the Jack Nicklaus Signature Golf course and lake. On the second floor your family and guests will enjoy a private family room that could be used at a sixth bedroom or retreat to one of the four luxury bedrooms with private bath. The larger of the bedroom could be considered the second-floor master bedroom featuring a marble vanity, jetted tub and separate subway tiled shower. This bedroom also features a walk-in closet and a private three season sunroom ~ enclosed porch. Another bedroom features a private bath, walk in closet and a balcony overlooking the lake across the street. Two other bedrooms also featuring private full baths. Off the loft there is an additional balcony with lake views. 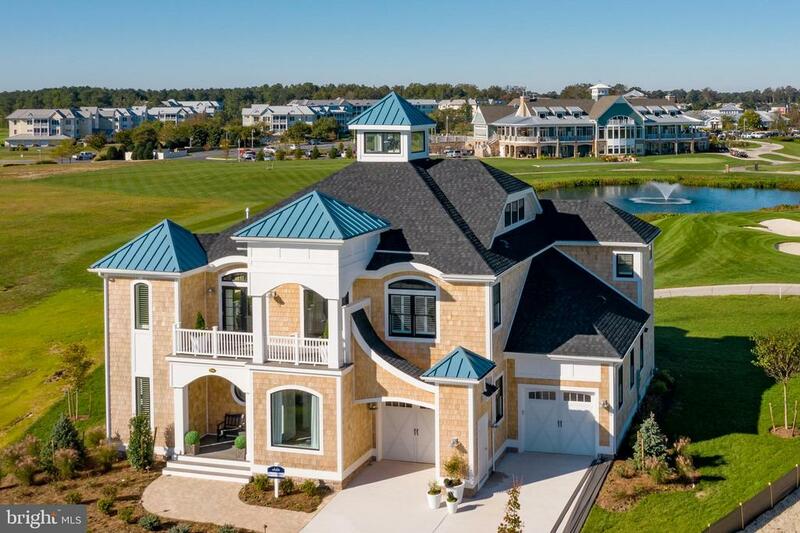 The Peninsula is an 800-acre gated private Jack Nicklaus Signature Golf community on the Indian River Bay with resort style amenities, indoor heated pool, hot tub, outdoor heated adult pool, hot tub and a sandy beach wave pool with lifeguard. State of the art fitness center, fully staffed spa, restaurants, kids~ recreation room, private bay beach, fishing pier, Kayak launch, nature pavilion. The 32,000 sq. ft Clubhouse features a spectacular restaurant with center bar playing golf on 8 screens. The new party room, billiards room and outdoor verandas are welcoming to all. All lawn care, garbage removal, snow removal Verizon high speed internet and expanded HD cable programming through fiber optics are included in the HOA fees. Opportunity knocks! Why wait to build? Call today for your tour. $190 per sq ft for this gorgeous custom built home. Why wait to build? 4,200 heated sq ft. Virtual Tour! Premium Water & Golf Course Views from Every Vantage Point in a Stunning 4200 sf Custom Home in the Award Winning & Exclusive Gated Community of The Peninsula! This Home Boasts Every Expected High-End Finish and is Energy Efficient, Providing Elegance & Comfort. The Tree Lined Driveway and Stone Walk Leads You Up to the Flag Stone Front Porch. Dramatic High Ceilings! Two Expansive Master Suites with Luxury Baths; one features a Double Sided Indoor/Outdoor Fireplace. Gourmet Kitchen: High End Cabinets and Appliances. Living Room features: Wet Bar, Fridge, Built-In Wine Rack, Bookcases, Gas Fireplace and a Wall of Windows with Lake and Golf Views! Expansive Screened Porch with Fireplace and Stone Paver Grilling Patio. The Study/Office is Well Appointed with Custom Woodwork. The Second Floor with Family Room and Great Views through the Balcony?s Glass Railing. Jack Nicklaus Signature Golf - Resort Style Amenities - 800 Acres on the Indian River Bay! It's always a happy day in this beautifully designed and meticulously maintained home with stunning ponds views on a premium, private corner lot! Luxurious finishes and upgrades make this home a spectacular haven, just right for relaxing and also entertaining! The spacious and light-filled expanded Whimbrel floor plan, just a little over 3 years young, has all the design and energy efficient features you'd expect in a Schell home. In addition, gorgeous 7" wide plank hardwood floors are throughout the main living areas which feature an open concept Great room with cathedral ceiling, gas fireplace, and a wall of windows that showcase a screened porch, deck and large pond. The expertly designed kitchen is appointed with quartz countertops, premium white cabinetry, specialty lighting, stainless appliances, double ovens, farm style sink, instant hot, custom fitted walk-in pantry, and a stunning quartz top maple wood island. Step into the master bedroom with bay windows that has room for a sitting area, tray ceiling, walk-in closets with custom built-ins, and a spa-like master bath with shower and separate tub. Two additional bedrooms in the front of the home offer privacy for guests. A study provides the ultimate flex space, you decide, sitting room, office or additional guest sleeping. More upgrades: central vacuum, plantation shutters, beadboard trim, 6 ceiling fans, downlights with dimmers, a security system which can be remotely controlled, specialty coated garage flooring with wall storage system, irrigation well and landscape lighting with additional plantings. Check out VIRTUAL TOUR! Step outside and enjoy the Peninsula community with their world-class amenities, gated security, clubhouse, featuring a wine room, card room, billiards, bocce court, outdoor dining terrace, Jack Nicklaus golf course, driving range, pro shop and putting green. The Lakeside village features a fitness center with indoor, outdoor and wave pools, grille, weight room, hot tubs, sauna, spa, activities/game room, tennis, pickle-ball, basketball, dog park, community garden, nature center, bay beach, fishing pier and miles of walking trails. Year-round events and activities where you can make friends for a lifetime. Capital contribution to PCA is .5% of sales price and $600. to Marina Bay condo. Club membership is additional and is required, choose from 3 levels, see disclosures or call Val, 240-401-4677 for information. To-Be-Built, The Peterman is two stories featuring 4 bedrooms, 3 baths, living room, large kitchen, formal dining room, breakfast room with eating bar, 2 car garage and the ability to expand to 6 bedrooms! Price includes premium golf course lot. Golf course views and the LOWEST premium. Builder of the most energy efficient homes in the area, while continually improving features to maintain the current position in the top 1% in the nation for energy efficiency. Located in The Peninsula, a resort community boasting world-class amenities. A master-plan contribution of 1/2 of 1% of the final sales price will be due at settlement. Exterior features are community features. 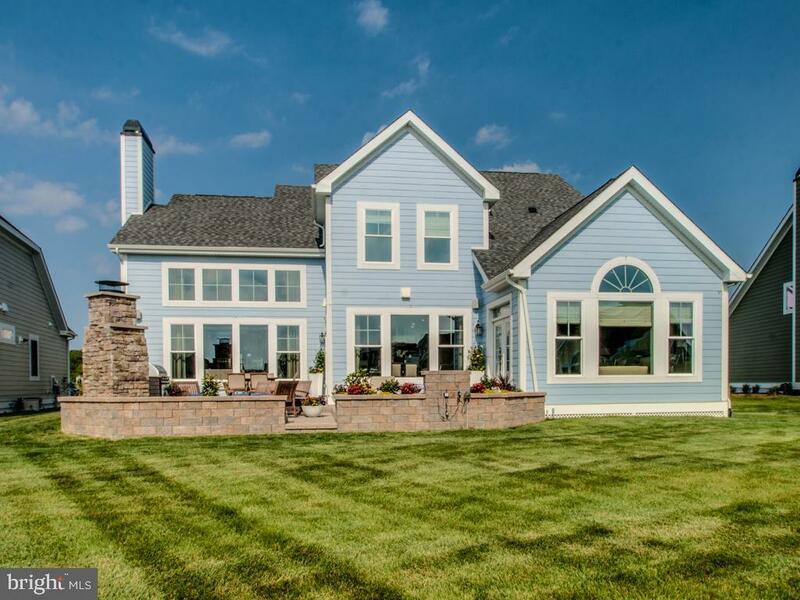 This beautifully landscaped waterfront home is in the highly sought after community of Lakewood Estates in Millsboro, DE. This one-story home has 3 bedrooms and 2 full baths, oak hardwood floors, 2 gas fireplaces, a kidney-shaped in-ground pool (approx. 18 x 36), (pump and liner 5 years old), gazebo with new this season custom made awning, and a fantastic year-round sunroom. Enjoy spectacular views of the lake from the owner's suite, great room, kitchen and sunroom. Spectacular landscaping with irrigation eelopes the entire home. Extra added features include a whole home back-up generator, Timberline HD architectural roof (5 years), 6-burner Heartland gas stove, Walker display system for hanging artwork, and central alarm with video monitors. Added bonus of very large attic storage. A versatile plan featuring a spacious foyer, formal dining room, a cook's kitchen with large breakfast bar open to the breakfast nook and family room. Right off the breakfast nook, you will find an all season morning room flooded with natural light. This plan also includes a private owners retreat with dual walk in closets and spacious bath. Two additional bedrooms and another full bath round out this plan. You can opt to add a powder room to the first floor and a second story with loft and up to two additional bedrooms and a full bath. Price includes premium golf course lot. Golf course views and the LOWEST premium. Builder of the most energy efficient homes in the area, while continually improving features to maintain the current position in the top 1% in the nation for energy efficiency. Located in The Peninsula, a resort community boasting world-class amenities. A master-plan contribution of 1/2 of 1% of the final sales price will be due at settlement. Exterior features are community features. Self owned business, have family, love established hunting and fishing? We have it all right here! Fabulous private 53+ acres with well maintained home, in-ground pool(new liner,pump and safty cover 2018), Trek decking, 2 stocked ponds, pole building, 2 on suite masters w/additional 3rd bdrm and half bath, and additional electric and water located in rear of property for RV guest! Cooks kitchen with Viking Stove and tank-less water heater. Rear deck accessible from all rooms in rear of home with beautiful retractable awning for sun protection. Separate drive to rear acreage to left of home and mound septic is located out of sight. Class H inspection has already been done! Free 1 year warranty included! This open concept, single story home features 3 bedrooms, including a spacious owner's suite with attached sitting room, en-suite bath and large walk-in closet. Entering the home, the large foyer leads you first to the formal dining room, which can be coerted to a study, then to the large living room which opens to the over-sized kitchen, breakfast area and morning room... perfect for entertaining. You can opt for a second floor loft with bathroom, or add up to three additional bedrooms upstairs for maximum versatility. Price includes premium golf course lot. Peterman and Cartwright will also fit on this lot. Golf course views and the LOWEST premium. Builder of the most energy efficient homes in the area, while continually improving features to maintain the current position in the top 1% in the nation for energy efficiency. Located in The Peninsula, a resort community boasting world-class amenities. A master-plan contribution of 1/2 of 1% of the final sales price will be due at settlement. Exterior features are community features. Unique Custom Home. Wheelchair Modified for Master Suite! Elevator plus one. Lovely and Well Built ! Ground floor above flood level! Waterview, New construction, It has 2 washers/dryers, 2 tankless water heaters, 8 Ceiling fans and 3 levels of decks plus a screened in porch. Community water and sewer. A must see! Have you always wanted to live on the water? This is your chance to own lakefront property. Pictures can tell a lot (a thousands words) but you need to visit and make your own pictures. This lake front property with a dock is waiting for you to visit and create your own pictures!!! Located just west of Millsboro you are close to shopping, eating and also not far from the beach - if you want additional water excitement. The Annual HOA fee of $25 is voluntary. The additional annual fee of $200 is for road maintenance since the roads are private. Why Wait to Build! A nearly new lake front Whimbrel home plan is waiting for you in Peninsula Lakes.This single level ranch home features unobstructed views of the community lake from the rear and is packed with upgrades, coeniences and added bonuses like, free electric until May 2019, natural gas heat and advanced building science features. Exuding peace and serenity from the minute you walk in, this open concept layout boasts a gourmet kitchen, spacious great room and elegant dining room. The lovely master suite offers two large walk in closets and a luxury bath with frameless walk in tiled shower and dual sinks. Expand your living space and enjoy being on the lake from your screened porch and sun deck off the back of the home. A full unfinished basement with rough ins ready for a bath is waiting below. You'll love living the resort lifestyle in this community with planned amenities that include a lakeside clubhouse with patio bar and lounge, fitness center and yoga room, an outdoor pool with splash pad, playground, tennis/pickleball, bocce ball, and horseshoe courts. Get outside and enjoy the dog park, walking path, garden center and fishing pier. Don't wait to make your move - this home has everything you are looking for and more! A must see, call today! Looking for Room to Spread Out? This Spacious 5 Bedroom, 3.5 Bath, 5,422 sq. ft. 3 Story Custom Home along the 12th Fairway at Plantations Lakes Golf Community is a must see. All the Upgrades Imaginable and a Completely Finished Lower Level (Square footage not included) with a Bedroom and Full Bath and Plenty of Storage. Main Level offers an Upscale Chef's Kitchen Perfect for Creating those Family Gathering Meals. A Kitchen Dining Area, Formal Dining Area, First Floor Master Bedroom,Quiet Office Area, Great Room with Stone Front Fireplace and a Year Round Sunroom that Flows to the Back Deck with a Built in Gas Grill Make for the Perfect Layout. Other perks Include: Electric Solar Panels for Inexpensive Electric with a Transferable 20 Year Lease, Natural Gas, Multi Zoned Heating and Air Conditioning, Complete Home Security and an Irrigation System in Front and Back Yard to Keep the Fantastic Landscape in Tip Top Shape. The Amenities include a Community Center with Fitness Room, Outdoor Pool, Basketball and Tennis Courts all with a low, low HOA fee. The Golf Membership is Optional. All this located in the Quiet and Established Golf Community of Plantation Lakes. This is a One of a Kind Special House so don't miss this great opportunity. Home is currently listed well below appraisal from October 2017. Bring the Entire Family for Some Golf, Swimming or just hanging out at your new Home! This is the One You have Been Waiting for and after all....You deserve it! Looking for a waterfront beach home? This home is a boaters paradise with loads of room for all your boating toys. This home is direct bay front with boat access, 4 bedrooms and 3 bathrooms (the 3rd full bath is in the garage - possible coert to guest house), this home offers a main floor master and bathroom with lots of room upstairs for guests with a large double bedroom and a loft. This home has an open floor plan with balconies offering great water views. There is a boat ramp, pier and a covered boat lift. The property has an outside shower, fish cleaning station with a sink, and a hot tub in an enclosed room for year round enjoyment, boat storage, 2 garages and a shed for plenty of storage for all your beach/water toys. Quick Delivery Home!! This new Ocean View plan is going to be a real stunner! This huge ranch features a split and open Floor Plan, a Large Office or Den plus a "Pocket Office", a Walk in Pantry, 10' ceilings, and beautiful features throughout! Make your call today!